Hear the word cello and you might think mellow and classical, as in Yo Yo Ma. Fans of the Portland Cello Project have come to expect everything from orchestral pieces to full-blown pop music dance parties. The Sun Valley Center for the Arts will kick off its 2014-2015 Winter Concert Series on Saturday, Oct. 25, with the wildly popular Portland Cello Project at 6:30 p.m. at the Wood River High School Performing Arts Theater in Hailey. 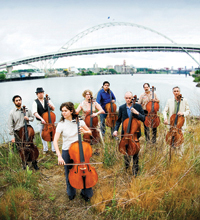 The cello group has been performing original tunes along with covers of indie-rock and pop songs for the past five years, from “Rock Lobster” by the B-52s, to Beck’s “Old Shanghai” and Radiohead’s “Electioneering.” According to the group’s website, there are more than 800 songs in its repertoire. Bretall said the group is guaranteed to surprise their audience with a versatile lineup. “They play everything from Bach to Brubeck to Beck. Expect to be wowed, by cellos, vocals, drums and more,” she said. The Portland Cello Project band members will be working with three groups of students from Wood River High School: Spiritus, the B-Tones and the Wood River High School Chamber Orchestra. The students will play alongside Portland Cello Project musicians during a few of their pieces during the evening concert. “Before this recent Portland Cello Project concert, I’m not sure that I’d truly realized how important live performances can be in helping you appreciate music,” reported Time magazine online. Blues musician Guy Davis on Dec. 12, 2014. Bill Payne, co-founder of Little Feat, on Jan. 30, 2015. Brian Sanders’ JUNK dance company on March 19, 2015. TorQ Percussion Quartet on April 18, 2015. Tickets for individual performances are $25 for members, $35 for non-members, and $10 for students 18 and under. Tickets for the Performing Arts Series are still available to members for $112.50 for all five performances. A Performing Arts “Mini Series” is also available for $67.50; this covers January to March performances only, which includes Bill Payne, JUNK and TorQ.